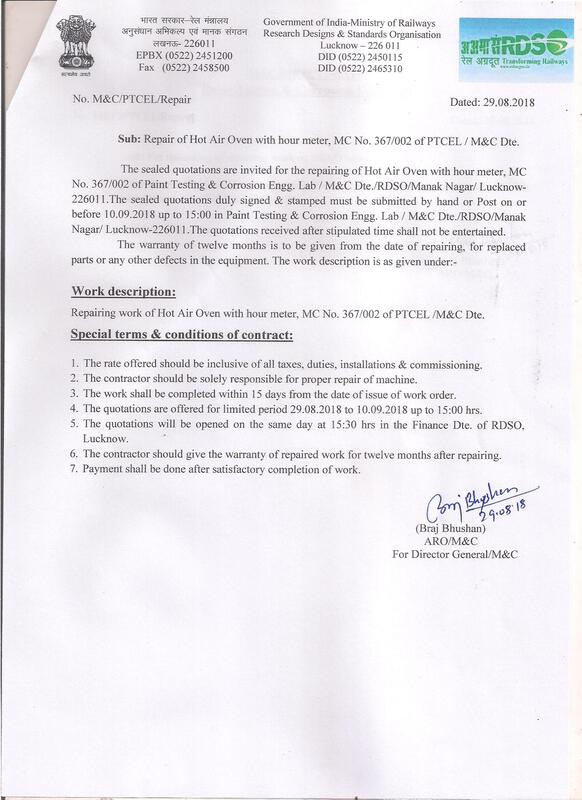 RM2/G/6.Kirloskar/2019/AMC Testing Annual Maintenance Services of 01 no. Kirloskar make 35KVA Diesel Generating set model no. HA-494 (Canopy type) installed in Oscillograph car no. BLRZ-7832 of Testing Directorate, RDSO through OEM or Authorized agent of OEM. 16.04.2019 02.05.2019 at 15.30 hrs. The work of Annual Maintenance Services of three years of 1 No.Kirloskar make 35 KVA Diesel Generating Set Model No. HA-494 (Canopy Type) Installed in oscillograph car no. BLRZ-7832 of Testing Directorate R.D.S.O., Manak Nagar, Lucknow through OEM or authorised agent of OEM (M/s Kirloskar). Comp/8.02.30/Part Comp.Wing Procurement of SMS Pack (50,000 SMSs). Hiring of Non-AC Multi-Utility vehicle for Office of Director/I&L, RDSO/Mumbai. Printing & Binding of 180 copies of list of approved vendors of Electrical items No. QAE-M-7.1-1 Ver. 6.0 w.e.f. 0101.2019 to 30.06.2019 on both side of A4 size paper. Annual Maintenance Services of 03 nos Powelux TATA make 50KVA Diesel Generating set model no. TPDG50 installed in differnt oscillography cars of Testing Directorate. IRCAMTECH.GWL.CiviI. Anti Termite CAMTECH Anti Termite Treatment of Administrative Building at CAMTECH, Gwalior. Instruments of Signal Lab. 15.10.2018 31.10.2018 up to 15.00 hrs. 17.10.2018 up to 15.00 hrs. QA/CT/PSC/Training QA Civil Directorate Quotations are invited for Hiring of a 35 seater Non AC Bus for trip from RDSO/LKO/to CSP-Budwal (Barabanki) and back on 16.10.2018 for field training to officers of different zonal railways. 09.10.2018 15.10.2018 up to 11.00 hrs. IRCAMTECH, Maharajpur, Gwalior for 90 days. 08.10.2018 12.10.2018 up to 15.00 hrs. Repair of Hot Air Oven with hour meter, MC No.367/002 of PTCEL M&C Dte. Provision of Four Persons for Cleaning of CAMTECH premises, Gwalior on Hiring Basis. Filing of the patent in name of RDSO for the invention "Train Collision Avoidance System"
Re-certification of RDSO to ISO 9001:2015 for a period of 03 years. Calibration of measuring instruments in Telecom Lab at RDSO/Lucknow.